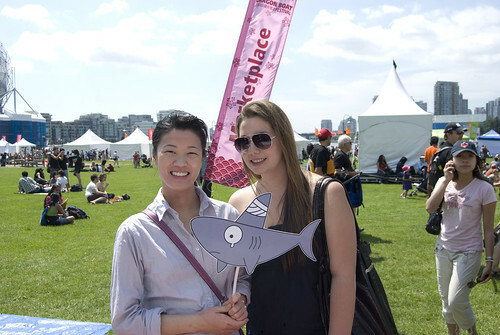 The annual Dragon Boat Festival attracts 100,000 visitors in Vancouver to honour the tradition of dragon boat racing. This weekend, Harry made another public debut at the festival with the of the Shark Truth team. We had a great time playing trivia games with everybody, talking about our favourite animal – the shark – and enjoying the music and festivities of the Dragon Boat Festival. Winners of the prize draw will be contacted directly for their free introduction diving lesson – courtesy of Edge Diving. Thank you for energizing us to continue to Stop The Soup and we can’t wait to see everyone again. Keep an eye out for us during Shark Week coming the first week of August. Check out the photos from the event on our Flickr photostream. This weekend, Harry and the Shark Truth team will be tabling at the Dragon Boat Festival to celebrate our one-year anniversary and we invite you to swing by and say hello. 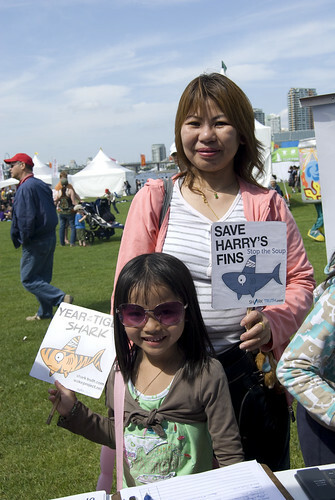 It will be a family event welcoming all ages: check out our Harry cut-outs or get a shark hug from Wake, our ocean friends tabling next to us. We will also be showcasing wedding couples that entered our Happy Hearts Love Sharks wedding contest. Last Chance to Get Your Votes In! Less than 2 weeks left to vote for your favourite couple. Here’s a round up of our current contestants and their rankings! Just a recap of our prizes which are being donated by our generous sponsors. Grand Prize: Trip to Mexico for 2 to swim with whale sharks–the largest fish in the world. International Prize: Waterproof digital camera and an adopt a shark package.